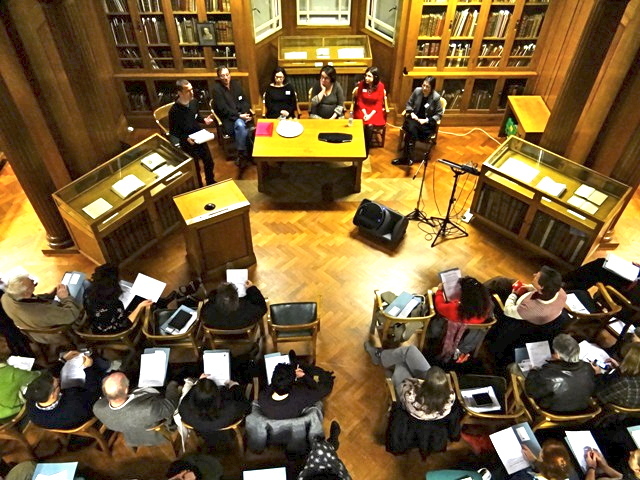 The Re-Visioning the Brontës Conference took place on 29 January in The Brotherton Room, which holds about fifty people comfortably. Attached to Special Collections in Leeds University’s Brotherton Library, it has plenty of atmosphere, with oak columns and panels, proximity to rare Brontë manuscripts and a presiding bust of a big-whiskered Lord Brotherton. It has been used on occasion, I was told, for the telling of ghost stories, which seemed to be an appropriate fact to bear in mind during the conference, in which one of the unofficial keywords was ‘afterlife’. Conference Organiser Nick Cass from the School of Fine Art, History of Art and Cultural Studies, spoke to us first, and it was soon clear that the acoustics of the place are not perfect : people sitting on the periphery found it hard to hear, especially if the speaker did not project in their direction. Listening to David Wilson’s tenor saxophone was no problem, though. He played beautifully while we looked at Simon Warner’s evocative landscape photographs on a large pull-down screen – Top Withins shrouded in mist, a watery sun over Stanbury - a mood-setting show which was followed by Jane Sellars, once at the Parsonage, now Curator of Art at the Mercer Art Gallery in Harrogate. She delivered a useful historical overview of the fluctuating fortunes of the Museum, drawing attention to the effects of films on attendance and pointing out that it was “extraordinary the amount of material which has come to light in the last twenty years or so – a substantial number of items have emerged from the shadows”. Dr Carl Plasa from Cardiff University, in ‘Southern Flight: Brontëan Migrations in Kate Chopin’s At Fault’ spoke about Chopin’s “neglected novel” of the late nineteenth century and the transatlantic afterlife of Jane Eyre, bringing in many references to contemporary assumptions about “white creole degeneracy” and the way in which Chopin had challenged these assumptions in her novel, which is set in Louisiana and packed full of characters who speak French, Spanish and Creole in addition to English. His enlightening hand-out (‘Prefigurements and Afterlives: Bertha Mason’s Literary Histories’) drew parallels between Charlotte Brontë’s description of Bertha in Jane Eyre, Juanna Trista, a ‘pensionnaire’ in The Professor and a mentally ‘incompetent’ wife (alcoholic) in At Fault. To my surprise, at least, he made just one fleeting reference to Jean Rhys’s Wide Sargasso Sea. Amber Pouliot from Leeds University, (‘Righting the Life of the Mind: The Significance of Psychological Discourse in the Brontës’ Interwar Afterlives’) spoke about an emphasis by critics on Charlotte for most of the nineteenth century which shifted to Emily to some extent in the early twentieth century, when she might have been seen as a model of a ‘new woman’, attitudes to mental illness to be found in the frameworks of nineteenth century belief, and comments by twentieth century commentators who were influenced by psychoanalytical theories which, ironically, originated in Gaskell’s view of Charlotte and the Brontës. Aislinn Hunter from Edinburgh University began her lecture, which was illustrated by slides, with references to the ancient manuscripts of Timbuktu which some people thought might all have been burned by Islamist extremists (apparently some of them were successfully hidden) because she had much to say, in ‘The Brontës, Materiality and Resonance: Three Ways of Looking’ about original artefacts and documents and “the resonances which they give off”. These depend on context (for example in a museum), on foreknowledge and on tradition to a large extent, but also on the way our brains work: specialized parts of this organ deal with memory and with our perceptions of beauty and truth. She did not quote from Keats, but she did give us a brief overview of the way neurons behaved. Her illustrations on the screen included works by Victoria Brookland and Cornelia Parker – “…an encounter with the artist and with the artist who had the encounter with the Brontës”. Dr Richard Brown from the University of Leeds’s English Department was in conversation with Professor Blake Morrison from Goldsmiths, University of London on Morrison’s play We Are Three Sisters, which was shown at the Viaduct Theatre in Halifax, performed by Northern Broadsides, in September 2011 (see this blog’s review here) before touring. Intelligently and wittily, Morrison managed to use Chekhov’s Three Sisters as a template, which involved some squeezing and shoving (for example, having Mrs Robinson actually staying at the Parsonage and bringing on a William Weightman character years after his death) but which resulted in a very watchable play. Morrison explained the problems involved in pursuing a personal project which dated back many years. Dr Jenny Bavidge, lecturer at Cambridge University, showed clips with music. “The name ‘Wuthering’ invites an auditory experience,” she said, in ‘Listening Out: the Soundtracks and Film Scores of Wuthering Heights.’ Is music too blunt an instrument? Does it elicit too much of a Pavlovian response? We watched extracts from the William Wyler version from 1939 – music all the way through, for everything. ‘Cathy’s Theme’ makes the film “Cathy-centric”. We saw Merle Oberon’s Cathy standing in front of a window for her declaration of shared identity with Heathcliff – with not just the music but a clap of thunder. Then there was the Peter Kosminsky version – an edgier sound, Irish connections, and Bunuel’s Abismos de Pasion (1954) with its use of Wagner’s Tristan und Isolde… but what we did not see an extract of was Andrea Arnold’s version, where there is practically no music (although the Young Cathy does sing Barbara Allen) but plenty of wind. Maria Seijo-Richart from the University of A Coruña showed us clips and stills as well, for ‘Wuthering Heights in Japan: the film Arashi ga Oka (1988, directed by Yoshishige Yoshida)’. She explained how Japanese film-makers relate Western classics (for example Macbeth) to Japanese theatre traditions and storytelling techniques. It was fascinating to hear how the Noh Theatre influenced the director – the orphan Onimaru is looked after by a group of priests who worship a Mountain of Fire and who try to appease gods of anger. He is in love with Kinu, beautiful daughter of a local family… and she later dies in childbirth. Towards the end of the day, a roundtable discussion chaired by Adam Strickson, Teaching Fellow in Creative Writing at Leeds University, did not seem to last very long, making many of those present think that the conference should have had more time allocated to it. Perhaps the next one – let’s hope for a next one – will be for two days. The new Director of the Brontë Parsonage Museum, Ann Sumner, brought the proceedings to a close with some well-chosen remarks and an overview of the main areas covered. The conference was organized through the Centre for Critical Studies in Museums, Galleries & Heritage and the Stanley & Audrey Burton Gallery, and was funded by CCI Exchange – the University of Leeds Higher Education Innovation Fund. Thank you for that excellent review. As I found the projection of the voices not very acceptable I was pleased that I have been able to read quite a few things I had missed in the presentations. Yes- the day was over far too quickly, yes- let's have another conference lasting for two days and,if we do, please can microphones be available. A great day and what an excellent write-up. The many and varied responses to the Brontës presented and discussed were nothing less than inspirational. The exhibition accompanying the conference was stunning as a whole but each individual re-visioning work was utterly memorable. Congratulations to all concerned. I have to say that I was intrigued by Aislinn's reflections on resonance. Why do we respond as we do to objects and places? In essence that's what this conference and the exhibition was all about. Why do artists continue to respond to a place, a family, to writings - to this family, this place and these writings who lived so many years ago? Almost fifty years after my first visit to the Parsonage, still it never fails to move me: in December when often there is silence and the Christmas wreath is on the Parsonage door; in Spring as the days lengthen; in summer when tourists crowd the path; in the Autumn as the heather garden bursts into colour. Walking towards and into the Parsonage, standing at the door of each and every room - it continues to make me catch my breath. Looking at the audience, as David Wilson's evocative melodies accompanied images of the moors and of the Parsonage I could see that for many of them too this was the case. And they, like me will keep returning. Sally, I agree with what you say. But if you ARE so moved when entering the Parsonage, why oh why are you, as Chairman, so intent on turning it into a corporate business venture?